Wooden ridges and knobs will knead muscles, tendons, and ligaments until they purr. Go ahead: Do P90X, Crossfit, Zumba and Insanity all in one day, and then move a bunch of furniture. After that, you'll want a few sessions with our handmade wooden rope massager. 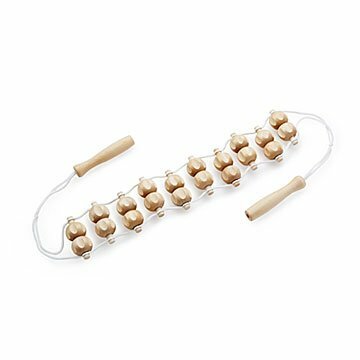 A simple but very effective tool with two handles and two rows of wooden rollers, position it any way you want to knead those protesting muscles, tendons, and ligaments in your back, neck, legs, or feet until they purr. Your happily humming nerve endings will send the message through your entire body to your brain, which will form the thought, "Gee, that feels good." (Note: Massager also effective after less ambitious days.) Made in Slovenia. Store in a cool, dry place. Do not submerge in water or use on wet feet. Wipe down with cotton cloth. Very nice self-massager, helps get those painful knots in my shoulders and upper back. Am a little worried that the strings might not last forever. My husband is always complaining about his aching back. He used this product once and he claimed he did not need to use it again for a few weeks! Its an awesome product for anyone! This is nicely constructed and seems stronger than it looks. Bought it for my husband but of course I was excited to use it! Worked nicely on my shoulder and it gives a nice tingle when used on the lower back. It's not a deep massage but it feels good considering you don't need a friend to help you. Has a bit of an unfinished / rough texture. Bought this for my husband for his first father's day. Late night's constantly picking up the baby was wreaking havoc on his back. This massager works great and is just what he needed! Virtually flawless....perfectly smooth rollers....much better than plastic......highly recommended!!! Great self-massager, a little rough, but it is effective! I liked this a lot. My dad and I both tried it out. You do have to apply some pressure (pull on the ropes) to get a good massage. The only thing I didn't really like about it was that the wooden balls weren't sanded well so you can't use it on your bare skin otherwise it will hurt. Or any clothes you don't want those little wood pieces sticking too. This massager is the best I've ever purchased! It allows me to get those stubborn knots that creep up while in deployment. Bonus is because of how it's designed I can use it on my calves, thighs, and feet when I've worked out a little hard and am tender. This massager is amazing!